This Demonstration shows a single-span Euler–Bernoulli beam under four possible support conditions and with three different loading arrangements. 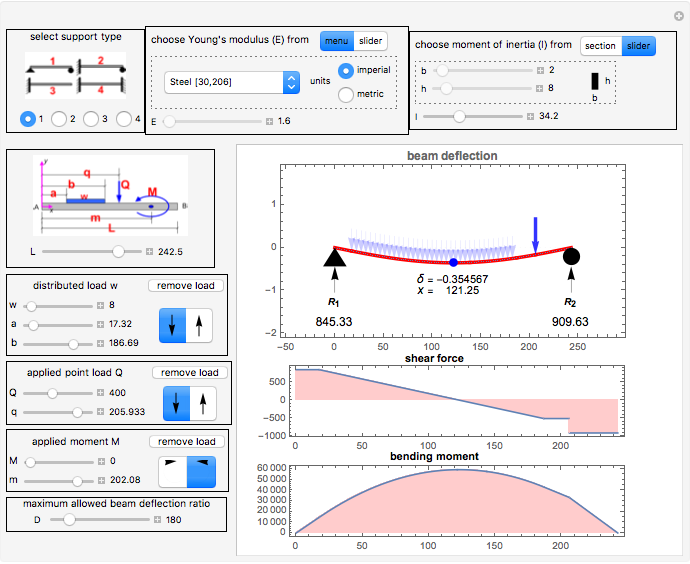 This Demonstration generates the deflection curve of the beam due to the loads, as well as bending moment and shear force diagrams. 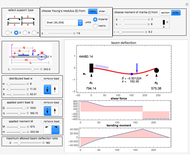 You can modify the loading, support conditions, and other parameters, such as Young's modulus and the moment of inertia . 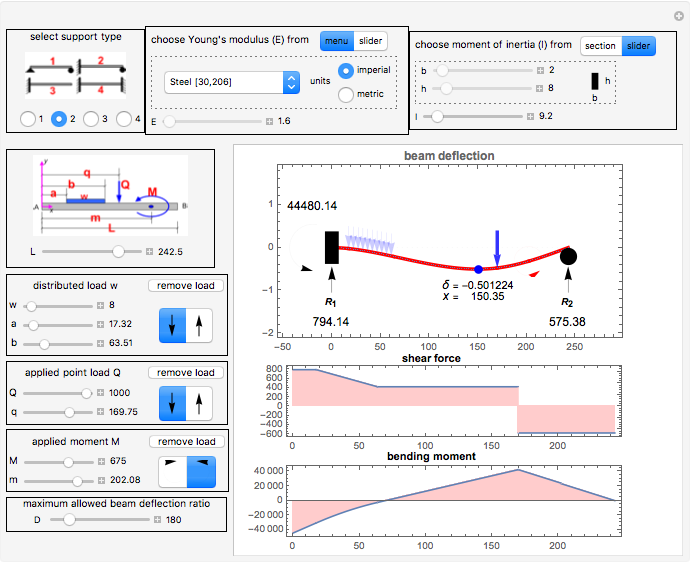 Then observe the effect of these changes on the beam's deflection, moment, and shear diagrams. The beam deflection is normally found by solving the fourth-order Euler–Bernoulli beam differential equation using the appropriate boundary conditions. The shear force diagram is used as the starting point here and then integrated three times to obtain the deflection . The reactions at the supports are obtained by solving the equilibrium equations for the determinate beam cases (simply supported at both ends) and the cantilever cases. For the indeterminate cases (fixed at both ends or fixed at one end and simply supported at the other end), the slope boundary conditions were used to obtain the additional equations needed to solve for all the unknown reactions. First, select one of the four different support conditions for the beam in the diagram at the top-left corner. The beam length is selected using the length slider located below this diagram. Select the loadings with the controls on the left side. A diagram is included that describes the different dimensions that define the loading positions and geometry. Using this diagram with the corresponding control variables, you can define different loading configurations. Three different load types are supported: point load with units of force, distributed load with units of force per unit length, and a couple with units of force times length. Select the Young's modulus from either the slider or by directly choosing the material from the dropdown menu. The numbers shown for the values of in this menu selection are the numerical values for for the selected material. The first number is in imperial units ( psi) and the second is in metric units ( Pa). These values are obtained from standard materials references. When the slider for is selected, each value is multiplied by . For example, to select a material whose is 1,600,000 psi, set the slider to . 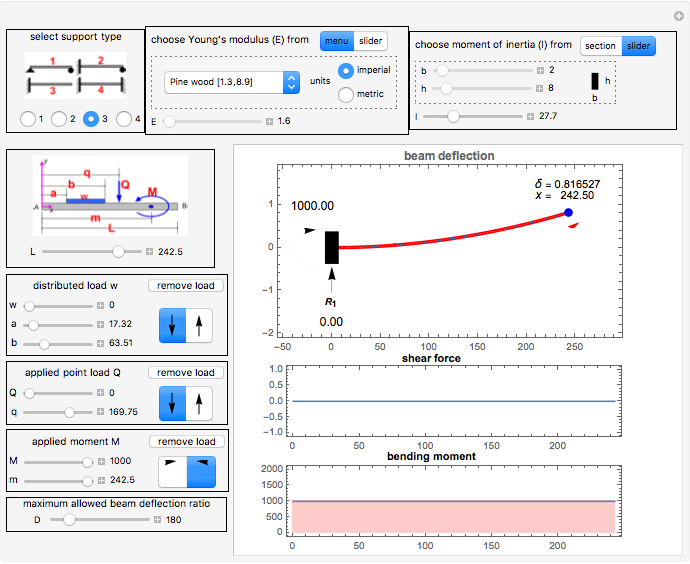 The moment of inertia is selected using the slider or by defining the geometry of the beam cross section. Only rectangular cross section is supported. In the cross section option, the moment of inertia is calculated using the standard formula . 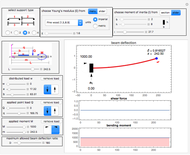 The deflection that the beam will experience is limited to a fixed value controlled by the parameter labeled "deflection ratio", located at the lower-left part of the control area. A deflection ratio of means that the beam's maximum deflection will not be allowed to exceed , where is the beam length. These ratios can be found in standard structural engineering references such as the International Building Code. Increasing the value of restricts the allowed maximum deflection of the beam to smaller values. For a typical beam used in housing construction, can be used. Once the maximum beam deflection (in absolute value) has reached the numerical value , a warning message is displayed inside the beam deflection plot indicating that the beam has failed. In this case, you can reduce the beam length, increase , increase , or reduce the current loading on the beam. 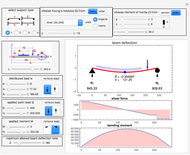 The plot range for the axis for the deflection curve is kept fixed at the maximum allowed deflection value in order to make it easier to see how the beam deflection changes as loads and other parameters are changed. Regarding the use of units in this illustration: use numerical values for the different parameters either in metric units or imperial units. It is the user's responsibility to make sure that values being selected for the different parameters are consistent with each other. For example, with length 10 feet and moment of inertia 57 inches , if the moment of inertia is entered as the number 57, the length should be entered as 120 and not as 10. When selecting from the dropdown menu, choose either metric or imperial for the units to be consistent with the units being used for the other parameters. In the three plots generated, the axis has length units and represents the beam length. For the deflection curve , the axis is the amount of deflection in units of length. For the bending moment diagram, the axis has units of force times length, and for the shear force diagram, the axis has units of force. To find the deflection at any location along the beam, move the mouse to the location over the deflected beam curve. The small blue ball on the deflection curve indicates the location of the maximum deflection. The deflection value at that point and the distance from the left end of the beam are displayed next to the ball. Nasser M. Abbasi "Analysis of a Single-Span Euler-Bernoulli Beam under Different Loading Conditions"